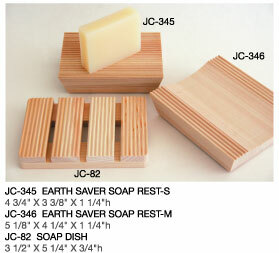 These Hinoki wood soap rests come in three styles and provide a great healthy place for your soap to rest. Hinoki (Japanese cypress) is grown in Japan under strict control. Since WW II, over 1 million acres of new forest have been planted and legislation regulates the sustainable harvest of this precious resource. All of the Hinoki products that we sell are made from 100% by-product wood that results from the thinning of forests which is required to maintain healthy growth. Creates a spa at home! Add the matching Hinoki Wood Tub Bar for putting shampoo, bath oils, books, beverages, personal care products, etc. on during bath time. Tub Bar is 31.5" length x 6.75" x 1". Need a Shower Stool too? Click here for the Hinoki Wood Sauna/Shower Stool!